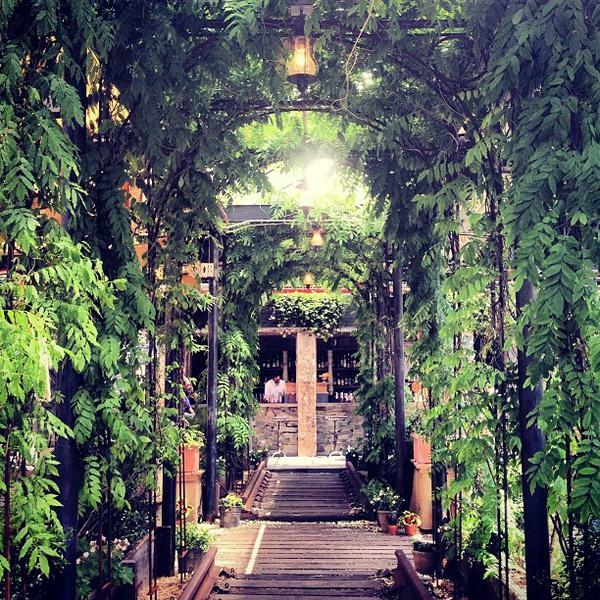 I’ve written about The McKittrick Hotel several times before (here too,) but I love this place so much that it deserves another post. Not to mention each experience here has been different and awesome, and now that it’s summertime, the rooftop bar Green Gallow is open! Being the amazing host that I am, I took both my parents and sister here on their separate visits. Notice I said “took” not “treated.” Lolz. Green Gallow is one of my favorite rooftop bars because it’s gorgeous! It’s like a chic, adorable garden oasis filled with potted plants, lush foliage and dainty flowers all around. The weathered wooden tables and potters make for nice touches too. Not to mention there are cool old railroads leading up to the bar, underneath a beautiful canopy of green. And when you walk off to the side, you can see some fantastic views of the city! Only downside—the drinks are offensively pricey. Despite that, I got the Foggy Night- tequila shaken with local dark honey, fresh lemon and sriracha and some slices of cucumber for refreshment… the perfect drink choice for me! After we took in some sunshine and cocktails, we made our way downstairs to the coolest dinner venue I’ve been to, The Heath. Stepping downstairs into The Heath is like time traveling into another era- it’s like you’re back in the 1930’s at a smokey speakeasy! There’s a large bar off to one side, lots of seating, very charismatic and decked out hosts and hostesses and a live jazz band that performs throughout the night. The jazz and vocals are on point and make the dining experience more like an entertaining dinner show! The entire setting and ambiance is so unique and unlike any other, I’ve had. Oh, and there are fancy couples straight out of The Great Gatsby strolling around the dining room, dancing around and schmoozing with diners. The night I came with my sister, we started with the amazing cheese board- a tasty variety of artisanal cheeses, beer jam, fermented honey and spiced nuts and the most amazing type of saltine cracker. I LOVE CHEESES! We both got the pre-fixe menu. My starter was the delicious mini pork pies- savory, spicy sausage bites wrapped in puff pasty. My main was the juicy roast chicken with lemon mash potatoes. My sister got the custardy asparagus and rice pie, which was creamy, almost sweet, and went nicely with the buttery, flakey puff pastry crust. The dessert was insane!!! We both chose: the decadent Nutella ice box pie! Creamy, rich goodness. The night with my parents I order the best thing on the menu, I’d say: the bone in lamb breast with roast baby carrots, dates, walnuts, watermelon radishes and dandelion greens. The veggie assortment was both beautiful and so fresh. And the meat was super tender. It had just the right amount of fattiness and that savory good lamb flavor that I crave when I want red meat! The lamb went amazingly well with the sweetness of the dates and crunch of the walnuts. It was such a pretty dish! I never heard of watermelon radishes, but they’re just gorgeous. For dessert? The fantastic apple bread pudding with fuji apple ice cream with a black pepper caramel drizzle. It was so buttery- the bread just soaked up all the caramel goodness. Next Post Aerial Yoga Adventures!